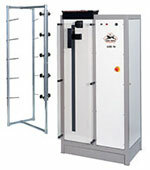 The Automated Yarn Strength tester is a robust, single end yarn tester designed to exceed the most stringent testing requirements for measuring yarn strength. The Automated Yarn Strength tester is capable of providing a variety of calculations including tensile strength, elongation, tenacity, work and modulus of an extensive range of yarns. The unit is a fully automatic yarn tester and can continuously measure up to 20 bobbins of different types of yarns. 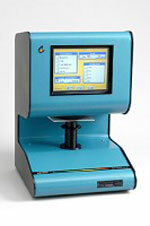 Test result and data storage is made possible through the instruments serial port to a PC to collect test information. Advanced software provides multiple plots, force/elongation histogram, linear regression and average force curve of a bobbin. Bursting strength is a widely-used measure of resistance to rupture in various materials. A test specimen is held between circular clamps and subjected to an increasing pressure from a rubber diaphragm. The diaphragm is expanded by a controlled hydraulic pressure until the test specimen ruptures. The bursting strength of the specimen is the pressure reading at the time of rupture. Automatic Package Analyzer (APA) is an off-line vision system that automatically inspects yarn packages for density and basic package dimensions. It is extremely easy to operate by simply placing the yarn package on the post. Automatic optional calibration takes place during each inspection. Test time is less than 3 seconds. Pass/Fail results are boldly displayed and color-coded for easy decision making. Data is stored in the computer for easy access. Benchtop Materials Testing Machines are designed to test a wide spectrum of materials including metals, plastics, rubber, textiles, paper, yarn, wire, adhesives, ceramics, timber, foils, composites and finished components in tension, compression, flexure or shear. Maximum frame capacities from 1kN to 75kN. 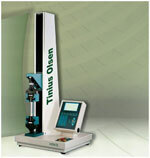 We offers two types of tensile tester at the listed capacity thresholds, namely the S series and the T series. The S series includes a control panel as part of the test frame to allow the machine to be used independently, whereas the T series must be connected to a Windows PC to be used. In addition to our standard test frames, Tinius Olsen offers a couple of select application testing frames capable of accommodating wide specimens or testing at ultra high speeds. Fabric Stiffness is a measure in which a material bends under its own weight. The Cantilever Bending Tester is an automated system which measures the overhang of a fabric material at a specified angle. The length of the overhang is measured when the sample is flexed to a 0.724 rad(41.5º) angle from the horizontal plane. The length of the sample overhang and the angle is then used to calculate the Bending Stiffness and Flexural Rigidity in accordance to ASTM D1388, Standard Test Method for Stiffness of Fabrics. The CTT is a versatile dynamic test instrument that is available as a mini textile laboratory. With its easy to change test attachments, the CTT is the only lab instrument that offers more than 10 yarn tests on the same instrument. This versatility along with its dynamic test principle, the CTT offers every fiber and yarn user the ability to eliminate the high cost of running trials on production instrument. Automated Count Balance by Brustio is used to quickly determine the count of slivers, rovings, yarns and area weight of fabric. The software includes (7) seven count systems (Tex, Den, Nm, Nec, dTex, Nel, New). The instrument is microprocessor based with system software which allows the operator to enter sample identification for data transfer and print out. Operator can schedule a series of measurements; standard software provides statistical analysis including upper and lower limits capable of reporting out of tolerance values. Crocking is a mechanical test to rub off a dye to determine if the dyeing method used to color the textile material was sufficient. The Crockmeter is use to determine the degree of color transfer from one surface to another. A wet or dry white test sheet is used to make the dye transfer from the test specimen. To determine colorfastness of textiles to dry or wet rubbing.Provided with a steel specimen holder and 16 or 25 mm diameter test finger.A pinned sample holder ensure rapid sample mounting and repeatability result, after prefix cycles, with a downward force of 9 or 22 Newton. The Elongation test measures the % elongation of the yarn as it is running under constant tension at test speeds up to 360m/min. The Elongation test can provide continuous measurements of more than 21 km of yarn in one hour. Multiple yarns are used side by side during weaving or knitting and all the yarns are required to have the same elongation level as they are moving. This test shows the true elongation of the yarn when it is moving under constant stress. Improvement in material quality and production efficiency can be achieved by testing yarn elongation before it is used in production. Windows based, user-friendly software collects the elongation data in real time. At the end of each test, the data is statistically analyzed, saved and ready to be exported to a database.